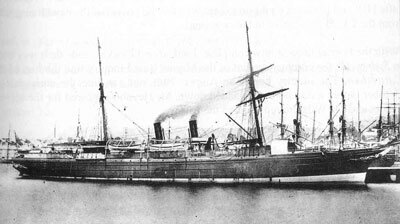 The SS Centennial was an iron single screw steamship built as the SS Albion in Greenock, Glasgow, Scotland, in 1863. She was 66 metres long and displaced 668 tons. A passenger and cargo vessel, the Centennial was a regular sight on the Sydney/New Zealand run. I do not have any more information on its early days. On 23 August 1889, the Centennial arrived in Sydney and quickly took on a load of 52 passengers and wool before leaving for Wellington, New Zealand at 8.45pm. 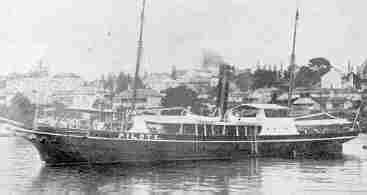 As she approached Bradleys Head, the collier SS Kanahooka in-bound from Wollongong, was travelling up the western channel (that is, the correct channel). As the Centennial passed Bradleys, the two vessels came together, the collier striking the passenger liner on the startboard (right) side. The blow was such that coal started falling into the water and the passengers on deck could see that the Centennial was doomed. Captain C.G. Lessing attempted to run the ship aground on Taylors Bay Beach which is adjacent to Bradleys Head but she could not make it. Within six minutes, the Centennial had sunk, with its masts sticking out of the water. All 52 passengers and 30 crew were taken off the ship without incident by a number of vessels, including the Kanahooka, the Bee and the pilot vessel Captain Cook. The Kanahooka then continued to Circular Quay where she off-loaded the victims, including one man who had ended up in the water with badly smashed legs. The Kanahooka then uploaded its cargo of coal into the P&O ship Victoria before herself being drydocked to repair the severe damage she suffered. Today the wreck of the Centennial lies on the eastern side of Bradleys Head in Taylors Bay. It is closer to the tip of Bradleys Head than it is to the head of the bay. The depth of the water is approximately 13 metres. To find the wreck place the lighthouse at Bradleys Head behind the head and then you will see a tall tower with a black box on top on the skyline (this is to south-west). This left side of this building needs to be right on the edge of the rock platform. To the north-east, the outside of North Head needs to be just off the left side of the old house on the inside of South Head. The depth around here is about 14 to 15 metres but the wreck comes up to about 12 to 13 metres. In April 2004 there was a large yellow buoy a few metres to the west of the wreck. I am not sure if it goes to the wreck (but see later). The GPS reading for the Centennial is a latitude of 33º 50' 58" S and longitude of 151º 14' 56" E. Note that all the GPS Readings on my Web Site are taken using AUS66 as the map datum. If you use another datum you may be about 220 metres off the wreck. See my GPS Page for more details and how to convert readings. The wreck is very broken up. 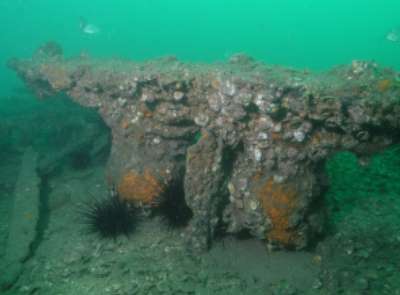 Not just that, the wreck has been colonised by millions of mussels over the more than 115 years since the Centennial sank. In addition, the sand from the bottom nearby has built up against the remains of the wreck. As such, the bottom here appears to be a hill but in reality, this is the wreck, covered with millions of tonnes of sand. Therefore, when searching for the wreck with your depth sounder, do not expect to see a distinct sharp outline of a wreck, it is a small hill with some wreckage on the top and sides. Once you have anchored, drop to the bottom. You will see lots of wreckage. The wreck does not now really resemble a wreck but now and then you will see ribs, hull plates and other sections of the wreck. The bow appears to be facing the north. Swim up one side of the wreck and then back along the other. The only real thing I could identify was a bollard (and this was upsidedown). The fishlife was quite good, with lots of bream, some nannygai, yellowtail on the wreck. I also saw a few small moray eels as well as a school of catfish. The visibility in Taylors Bay is not real good, sometimes less than three metres but on my dive in April 2004 it was about seven metres. Not a wreck you would do too often, but worth at least the remainder of a tank after another dive. A total dive of about 20 minutes would be more than enough time.